Click for news on the transport strike in Italy. Channel delays: Eurotunnel freight UK: 30mins before check-in, busy. P&O Dover-Calais, 30mins Calais-Dover 19:55, Dover-Calais 21:20. Weather alerts: Amber alerts avalanche northern Norway, high winds Greece. Weather: Mainly dry. Really cold in the East. Sunshine Mediterranean. 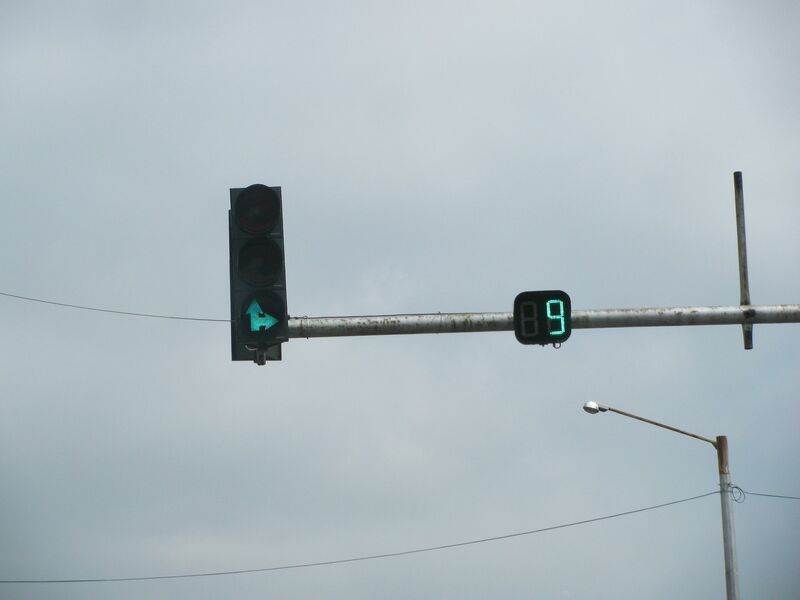 Countdown traffic lights – which let drivers and pedestrians know exactly how long they have before the lights change – are something we’ve only come across in Bulgarian capital Sofia (above) but are now set to become a feature in Brussels too. After trials outside the North Station they are now being installed on Wetstraat, the main thoroughfare east of the city centre, with other locations under consideration. Meanwhile, incoming francophone socialist mayor Yvan Mayeur says transport is one of his top priorities. Next week he unveils plans to pedestrianise areas of the city centre, likely to extend to Anspachlaan/Emile Jacmainlaan, the main north-south road across the city centre bordered by the inner Pentagon ring road. ROMANIA: A3 Comarnic-Brasov back on track. The first TransCarpathia motorway is set to get the go-ahead after two consortia submitted bids for the 58km Comarnic-Brasov stretch of A3. The Austrians (Strabag), French (Vinci) and Greeks (Aktor) compete against two Italian companies, Impreglio and Salini. The winner will be announced 20 December. Construction is due to start April 2014. The new road will vastly improve, if not complete, the road link between Bucharest and Brasov, and central Romania, and slash journey times. It’s real significance however is symbolic: overcoming the technical challenge of crossing the Carpathians for the first time, putting the chronically faltering major road building programme back on track and providing fresh impetus for the really strategic road, the A1 Bucharest-Sibiu-Szeged (Hungary), also across the mountains. Ultimately, A3 will link to Hungary too, at Oradea-Debrecen. update: the Strabag/Vinci/Aktor consortium won. Follow me: you just would wouldn’t you? Back by popular demand. What started out as a publicity stunt over the summer to promote the 50th anniversary of local firm Lamborghini is now a permanent feature. 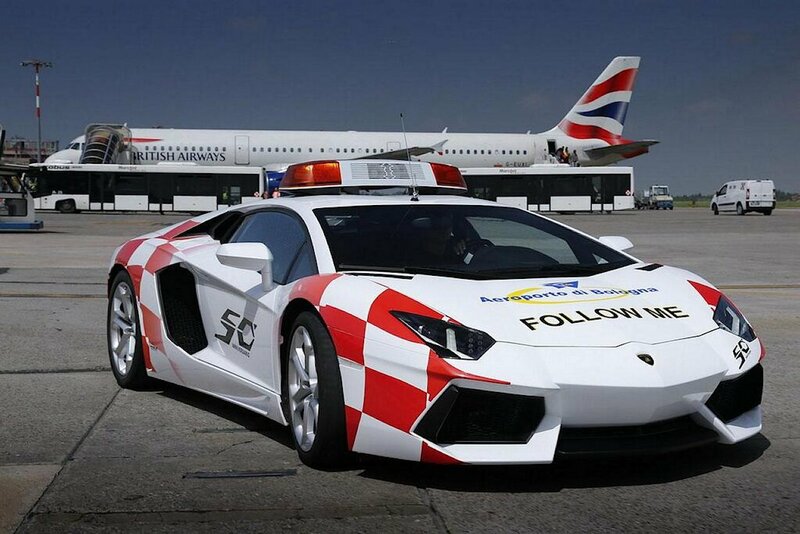 Bologna Airport’s specially liveried 700bhp Aventador LP-700 is actually used to accompany planes to and from the taxiway aprons, up to 140 times each day. Passengers can also buy mini Follow Mes in the airport shop. There’s also a display of full-size treasures from the Lamborghini Museum in the entrance hall.